As any good conspiracy nut will tell you, flags contain shocking secrets. 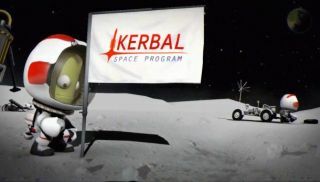 And the one planted on the supposedly "Munar" surface of this Kerbal Space Program update video is clearly flapping around. FAKERS! This was clearly a staged performance to highlight the new flag-planting feature! Normally, I'd be furious, but those newly expanded rovers are just too damn adorable. As well as the new vehicle parts and customisable flags, SQUAD's 0.20 milestone release also brings engine optimisation, bug fixes and editor improvements to the sandbox alpha. 23 Stock flags to choose from. Flags are Moddable, Make your own flag! The Editor no longer requires you to start with a command pod when building a ship. The Editor now allows deleting or replacing the first part of your ship. Added Game Database and repogrammed part loaders.